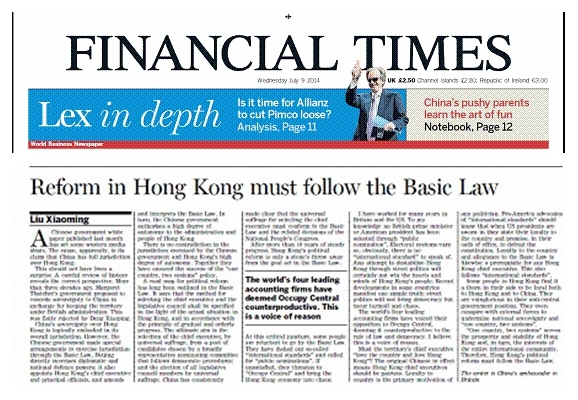 The following is full text of an article by Ambassador Liu Xiaoming titled "Reform in Hong Kong must follow the Basic Law", which was carried on 9 July 2014 by the Financial Times. "A Chinese government white paper published last month has set some western media abuzz. The cause, apparently, is its claim that China has full jurisdiction over Hong Kong. This should not have been a surprise. A careful review of history reveals the correct perspective. More than three decades ago, Margaret Thatcher's government proposed to concede sovereignty to China in exchange for keeping the territory under British administration. This was flatly rejected by Deng Xiaoping. China's sovereignty over Hong Kong is logically embodied in its overall jurisdiction. However, the Chinese government made special arrangements to exercise jurisdiction through the Basic Law. Beijing directly exercises diplomatic and national defence powers; it also appoints Hong Kong's chief executive and principal officials, and amends and interprets the Basic Law. In turn, the Chinese government authorises a high degree of autonomy to the administration and people of Hong Kong. There is no contradiction in the jurisdiction exercised by the Chinese government and Hong Kong's high degree of autonomy. Together they have ensured the success of the "one country, two systems" policy. A road map for political reform has long been outlined in the Basic Law. It says that the method for selecting the chief executive and the legislative council shall be specified in the light of the actual situation in Hong Kong, and in accordance with the principle of gradual and orderly progress. The ultimate aim is the selection of the chief executive, by universal suffrage, from a pool of candidates chosen by a broadly representative nominating committee that follows democratic procedures; and the election of all legislative council members by universal suffrage. China has consistently made clear that the universal suffrage for selecting the chief executive must conform to the Basic Law and the related decisions of the National People's Congress. After more than 10 years of steady progress, Hong Kong's political reform is only a stone's throw away from the goal set in the Basic Law. At this critical juncture, some people are reluctant to go by the Basic Law. They have dished out so-called "international standards" and called for "public nominations". If unsatisfied, they threaten to "Occupy Central" and bring the Hong Kong economy into chaos. I have worked for many years in Britain and the US. To my knowledge no British prime minister or American president has been selected through "public nomination". Electoral systems vary so, obviously, there is no "international standard" to speak of. Any attempt to destabilise Hong Kong through street politics will certainly not win the hearts and minds of Hong Kong's people. Recent developments in some countries manifest one simple truth: street politics will not bring democracy but incur turmoil and chaos. The world's four leading accounting firms have voiced their opposition to Occupy Central, deeming it counterproductive to the rule of law and democracy. I believe this is a voice of reason. Must the territory's chief executive "love the country and love Hong Kong"? The original Chinese in effect means Hong Kong chief executives should be patriots. Loyalty to country is the primary motivation of any politician. Pro-America advocates of "international standards" should know that when US presidents are sworn in they state their loyalty to the country and promise, in their oath of office, to defend the constitution. Loyalty to the country and allegiance to the Basic Law is likewise a prerequisite for any Hong Kong chief executive. This also follows "international standards". Some people in Hong Kong find it a thorn in their side to be loyal both to Hong Kong and to China. They are vainglorious in their anti-central government position. They even conspire with external forces to undermine national sovereignty and "one country, two systems". "One country, two systems" serves the prosperity and stability of Hong Kong and, in turn, the interests of the entire international community. Therefore, Hong Kong's political reform must follow the Basic Law."